We grabbed some fabric, made up a pattern for a simple dress, used puffy paint to paint on the dresses. For the hats we used a simple party hat and incorporated all of our colors and glued the fabric on the hats. 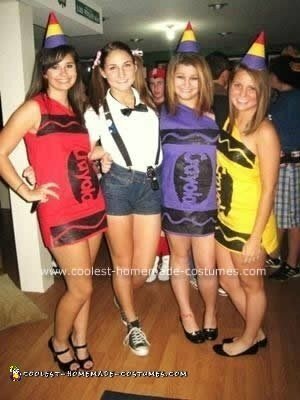 This was such an easy DIY Crayon Group Halloween Costume.